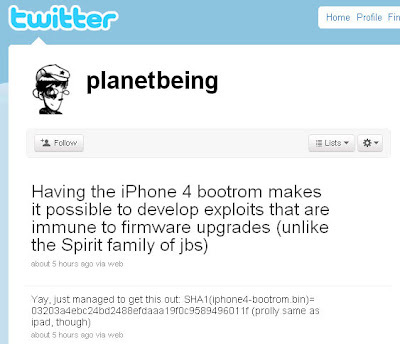 Planetbeing, of the iPhone Dev Team, enticed our imaginations and sparked our hopes with an exciting post on Twitter: a tweet that indicates that it is, indeed, possible to develop exploits that - get ready for this - can work far beyond the present days of the iOS 4 and well into the future of iPhone operating systems. One hour before the tweet that jailrbreakers are just now widely becoming aware of, Planetbeing also stated: "Yay, just managed to get this out: SHA1(iphone4-bootrom.bin)= 03203a4ebc24bd2488efdaaa19f0c9589496011f (prolly same as ipad, though)." Only a few short days ago, Nick chronicled MuscleNerd and planetbeing's announcement that Comex's Spirit userland jailbreak has been ported to work on iOS 4 and, yes, the iPhone 4. But it wasn't the bootrom exploit, meaning that Apple could patch it in a subsequent update. Thanks to the update today Planetbeing, we're now seeing the light at the end of the tunnel. Unfortunately - and, incredibly, we're already getting this question by the truckload - there is no release time as of yet. But all eyes are now on Planetbeing to see where we will go from here. Nonetheless, the first public image of Cydia running on the iPhone 4 is still enough to keep us up all night thinking about the possibilities that now shortly lie ahead.